A woman died in a house fire in the 1200 block of N. 15th Street around 2:30 a.m. Sunday, Feb. 1, 2009. Richard and Wanda Ulmer expected to wake up Sunday morning and attend church with their family. Instead, the couple were awakened about 2 a.m. Sunday to confusion and tragedy. Their daughter Michele Edwards, 39, was killed in an early-morning fire at her home on North 15th Street. One of their 7-year-old twin grandsons was flown to a Lubbock hospital in critical condition with third-degree burns over most of his body. Two other children suffered minor injuries. Edwards’ husband, Eddie Edwards, was not injured in the fire. The Ulmers raised three daughters in the house at 1234 N. 15th St. They said they gave the home to their oldest daughter and now live in a house behind her. Their three grandchildren often crossed the alley to get to the Ulmer’s home where a trampoline, sodas and swimming pool in the summertime are waiting for them. Michele Edwards was trapped in the bathroom of the house and is believed to have died from smoke inhalation, according to a news release from the Abilene Fire Department. Abilene fire spokesman Gary Hamner said neighbors told authorities they could hear the woman screaming from inside the burning home. She was found in the bathroom, where she had apparently turned on the shower to try to escape the flames, Hamner said. Hamner said the one 7-year-old twin boy suffered third-degree burns over 70 percent to 90 percent of his body and was flown to University Medical Center in Lubbock. His 9-year-old sister suffered minor burns on her shoulder and the other 7-year-old twin boy suffered minor injures. Both were taken to a hospital but are now staying with an aunt in Merkel, the Ulmers said. Eddie Edwards was in Lubbock Sunday with his son, the Ulmers said. Firefighters believe the blaze started in the room the twin boys shared but they have not determined the cause. “They lost everything they have,” Wanda said. A picnic table remains intact in front of the house. Everything else around the house is burned or badly charred. The American Red Cross is assisting the family, along with other neighbors who are volunteering their help. The fire department received a call on the structure fire at 2:21 a.m. Firefighters found the house fully engulfed in flames when they arrived. Three fire engines, a ladder truck, a battalion chief, a fire investigator, a safety officer and fire chaplain responded to the scene. Abilene police officers and ambulance personnel also assisted. Richard Ulmer said he knows Michele is in heaven, but will miss his daughter nonetheless. Richard said his daughter was a great mother who made sure her children were taken care of. Wanda said she will miss her daughter, after having her close for so long. “God, I’m going to miss her,” Wanda said. A yellow rose is entwined in the chainlink gate at 1234 N.15th Street Monday, Feb. 2, 2009 after Sunday morning's fire. Michele Edwards died from smoke inhalation during the fire. One of her sons, William Edwards, 7, suffered severe burns to approximately three-quarters of his body but was not expected to live. Two siblings suffered minor injuries as well but were released from hospital care to relatives. William Edwards, the 7-year-old boy who was severely burned in a fire at 1234 N. 15th St. early Sunday morning, is not expected to live, said Richard Ulmer, the boy's grandfather. Ulmer and his wife, Wanda, originally thought William was on a respirator, but they found out Monday afternoon that he has been breathing on his own with oxygen since he arrived at the hospital. His mother, Michele Edwards, died in the blaze. William's father, Eddie Edwards, twin brother, Willis, and sister, Amber, 9, survived the fire. An account has been set up at Citizens Bank, 4201 S. Treadaway Blvd., to help the family with expenses. The account is called the Lytle South Baptist Memorial Fund, and the number is 1468782. Amber and Willis have been staying with relatives in Merkel, but they returned to Abilene today. Eddie Edwards is still with William in Lubbock. "He loved her," Ulmer said through tears this morning about Eddie Edwards' love for Michele. "They dated seven years before they got married." Richard and Wanda Ulmer live across the alley from the Edwards' home. The children played in their grandparents' yard so often, it was like a second home for them, Richard Ulmer said. Neighbor Peggy Galbraith said she thought the children were like "old-fashioned children" because they played outside so frequently. "It broke my heart," Galbraith said about the fire. Ulmer said there is still no word on the cause of the fire. Photo courtesy of the Ulmer family William Edwards is pictured in this family photo. The 7-year-old boy died Tuesday, Feb. 3, 2009 from burns received in a house fire Sunday. Photo courtesy of the Ulmer family Michele Edwards is shown in this family photo with her twin boys Willis, left, and William. 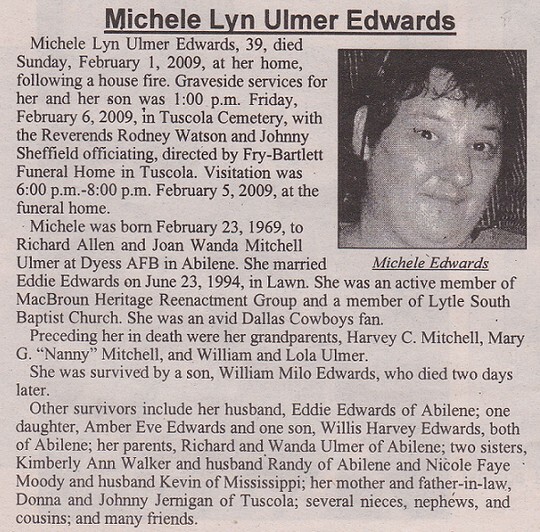 Michele died Sunday morning, Feb. 1, 2009 from smoke inhalation when her home caught fire. William suffered burns to nearly three-quarters of his body and died from his injuries Tuesday in a Lubbock hospital. Willis and his sister Amber received minor injuries as well. Reporter-News Photo by Ronald W. Erdrich A yellow rose is entwined in the chain-link gate at 1234 N. 15th Street on Monday. Michele Edwards died in Sunday's fire. One of her sons, William Edwards, 7, who suffered serious burns to nearly 90 percent of his body, was not expected Monday to survive his injuries. Two siblings suffered minor injuries but were released from hospital care to relatives. Richard Ulmer wipes his eyes as he talks Monday about his daughter who died in a house fire across the alley from his home Sunday morning. William Edwards, the 7-year-old boy severely burned in Sunday’s fire on North 15th Street, died this morning at about 4 a.m., according to the boy’s uncle Randy Walker. William’s mother Michele Edwards was killed in the fire. Edwards’ twin brother Willis, and sister, Amber, 9, and father Eddie survived. An account has been set up at Citizens Bank, 4201 S. Treadaway Blvd., to help the family with expenses. The account is called the Lytle South Baptist Memorial Fund, and the account number is 1468782. Several community members, friends and family also have been bringing food and other items to the Ulmer home. Rodney Watson, pastor at Lytle South Baptist Church, said the church is assisting anyone who wishes to help the family. Walker said the family has received an incredible amount of support from the community and from across the nation. Amber and Willis have been staying with relatives in Merkel and returned to Abilene today. However, the two children will return to relatives in Merkel for now. Eddie Edwards is with William in Lubbock. Richard and Wanda Ulmer live across the alley from the Edwards’ home. The children played in their grandparents’ yard so often, it was like a second home for them, Richard Ulmer said. It’s where William ran to wake his grandparents and tell them about the fire. He left bloody footprints in the Ulmers’ house. After turning on the lights, Wanda saw William covered in black. William hated pain, but was not crying or screaming that night. That was the last thing she heard him say before he was taken to the hospital. Wanda Ulmer remembers her daughter Michele Edwards as a woman with a great spirit and happy personality. She remembers how Michele was tearing down a neighboring house just months after hip replacement surgery almost two years ago. Richard Ulmer remembers Michele regularly bursting through her parents’ back door, asking Wanda how she was that day. “That’s the type of person she was,” Richard said. William, they said, is a daredevil. Wanda said William would jump off the ladder into the swimming pool and had the training wheels taken off his bicycle after just a month when he was 5. Neighbor Peggy Galbraith said she thought the children were “old-fashioned children” because they played outside so frequently. “It broke my heart,” Galbraith said about the fire. Lt. Greg Goettsch of the Abilene Fire Department said there was still no word on the cause of the fire and that it might be days before one is determined. reporter-news Photos by Victor Cristales Lynette Shessield, second from right, comforts her 7-year-old nephew Willis Edwards as Abilene fire Chaplain Chris Hale, left, says a prayer during the graveside services for Willis' mother, Michele Lyn Edwards, and brother, William Milo Edwards, on Friday in Tuscola. Daniel Smith, 6, left, offers his condolences to his friend Willis Edwards after the graveside service. As his mother and his twin brother were laid to rest Friday at the Tuscola Cemetery, 7-year-old Willis Edwards watched almost listlessly from his wheelchair, his eyes hardly ever looking up. His best friend Daniel Smith never left his side during the service and, dressed in a camouflage jacket and military helmet, seemed to almost be protecting his playmate. Edwards' mother Michele, 39, died Sunday in a fire at the family's home in the 1200 block of North 15th Street. His twin, William Edwards, died early Tuesday at a Lubbock hospital, where he had been flown for treatment. Willis, sister Amber, 9, and father Eddie survived. Eddie Edwards kept an arm around Amber nearly the whole ceremony, comforting her even as she coughed several times. Amber eventually moved to her father's lap to make way for a family member to sit next to William. Daniel's mother, Kim Smith, said after the service that her son often played with the Edwards twins, up until hours before the fire, when she told the twins to go home -- right across the alley -- because it was getting dark and their mother would get mad. The graveside service, attended by several hundred, was simple. Mother and son were placed in one casket that was topped with a colorful bouquet of flowers and several stuffed animals. Rodney Watson, pastor of Lytle South Baptist Church, officiated. To put two people in the same casket is unusual, but Michele and William Edwards had many things in common, including "tremendous, sweet smiles," Watson told the mourners. "This event is one of faith," Watson said. "When you look back and think of them, celebrate their life together." A big part of Michele's life was the Dallas Cowboys, he said, drawing laughs. William was described by Watson as a "live wire," a daredevil who jumped from a trampoline into a pool. For anyone who does that, "daredevil fits good," Watson said, again drawing chuckles and laughter. "Go Tell it on the Mountain," and a bagpipe rendition of "Amazing Grace" were among songs performed at the service. "Go Tell it on the Mountain" was apparently one of Michele Edwards' favorite songs. Some of the mourners were William's classmates and principal from College Heights Elementary School, and many were Abilene residents who came to pay their respects to the family. Members of the Abilene police and fire departments -- including the chaplains of each -- also attended the service. The Fry-Bartlett Funeral Home of Tuscola donated its services.